Top jockey Chad Schofield produced a gem of a ride to lift De Little Engine to victory in the J.B. Cummings AM Tribute Plate (2800m) at Flemington. Schofield, who is now based in Hong Kong, was set a seemingly impossible task when he was at the tail of the big field and near the rails as they cornered for home. But the young star picked his way through the field before switching to the outside late and De Little Engine ($9.50) did the rest, swooping over the top to beat Jim's Journey ($7.50) and Tremec ($61). “I was back travelling with a lot of horse,” Schofield said. “He was quite keen in the run, but Joao Moreira on Sasenkile stopped in my lap pretty quickly so I went back to the inside with how the track is playing lately. Trainer Danny O'Brien was rapt to get the result, paying tribute to Schofield’s brilliant ride. “He just needed to get a little bit of luck and Chad really steered him through the traffic and he was always going to stay on really well late,” O’Brien said. “It’s always a concern (when he gets that far back) because he sets himself such a big task and he wasn’t ever going to be able to come around them today so we did need a few breaks in the straight. “But we had the right guy on board, he’s won a Cox Plate for us Chad, so we’ve always got plenty of confidence when he rides. De Little Engine will now step up to 3200m for his next assignment. 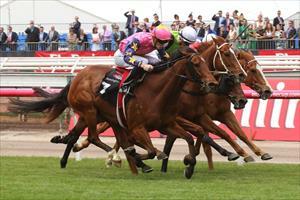 “He’ll go to the Sandown Cup,” O’Brien said.